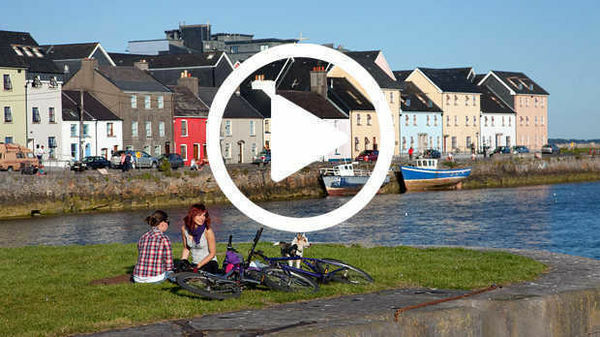 We find the icons of Ireland strewn along its fascinating south coast: Waterford's much-loved crystal factory, the Dunbrody Famine Ship, and Kinsale's star-shaped fortresses. After kissing the Blarney Stone, we visit elegant Muckross House. 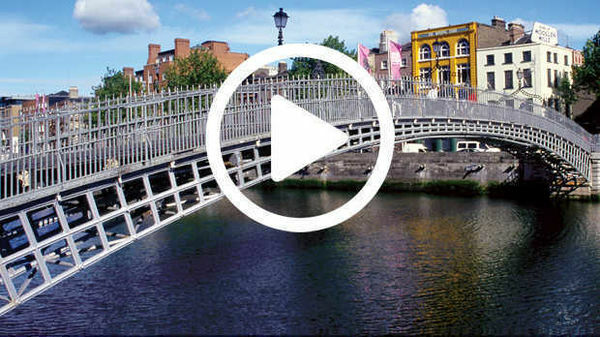 Then we savor the scenic charms of the Emerald Isle by driving the Ring of Kerry. The valley's sights are split between the two lakes. The smaller, lower lake is just beyond the visitors center and nearer the best remaining ruins. The upper lake has scant ruins and feels like a state park, with a grassy lakeside picnic area and school groups. Walkers and hikers will enjoy a choice of nine different trails of varying lengths through the lush Wicklow countryside (longest loop takes four hours, hiking-trail maps available at visitors center). Summer tour-bus crowds are terrible all day on weekends and 11:00–14:00 on weekdays. If you're there midday, your best bet is to take the once-daily, 45-minute tour of the site. Otherwise, ask if you can tag along with a prebooked tour group's tour. If you're on your own, find the markers that give short descriptions of the ruined buildings (free to enter the site). A mile above the village of Enniskerry, the Powerscourt Estate Gardens cover 47 acres within a 700-acre estate. The dreamy driveway alone is a mile long. The mansion's interior is only partially restored after a 1974 fire (and only available for special events). But its meticulously kept aristocratic gardens are Ireland’s best. Upon entry, you'll get a flier laying out 40-minute and one-hour walks. The "one-hour" walk takes 30 minutes at a relaxed amble. Today's lighthouse is 110 feet tall and looks modern on the outside. But it's actually 800 years old, built on a plan inspired by the lighthouse of Alexandria in Egypt. Since it's a working lighthouse, it can be toured only with a guide. The Dunbrody is a full-scale reconstruction of a 19th-century three-masted bark built in Quebec in 1845. It's typical of the trading vessels that originally sailed empty to America to pick up goods; during the famine, ship owners found that they could make a little money on the westward voyage. On board, extended families camped out for 50 days on bunk beds no bigger than a king-size mattress. Commonly, boats like this would arrive in America with only 80 percent of their original human cargo (in worst cases, only 50 percent). With a tradition dating back to 1783, Waterford was once the largest – and still is the most respected – glassworks in the world. The economic downturn of 2008 shattered the market for luxury items like crystal, forcing the huge Waterford Crystal factory outside town to close (in 2009, after this TV episode was filmed). The company was bought by American investors who opened a new, scaled-down factory in the town center. While 70 percent of Waterford Crystal is now manufactured by cheaper labor in Poland, Slovenia, and the Czech Republic, the finest glass craftsmen still reside here, where they create "prestige pieces" for special-order customers. The one-hour tour of this hardworking little factory is a joy. It's more intimate than the old, larger factory, and you're encouraged to interact with the craftsmen. Large tour groups descend midday, so try to visit before 10:00 or after 15:30. This museum is an earnest attempt to make the city's history come to life. The topics — the famine, Irish emigration, Australia-bound prison ships, the sinking of the Lusitania, and the ill-fated voyage of the Titanic — are interesting enough to make it a worthwhile stop. Fishy Fishy Café, a high-energy destination seafood restaurant with spacious seating (indoor, balcony, and terrace) and a wonderful menu, is run by Martin and Maria Shanahan. When asked, “What’s your secret?” they pointed to the portraits of fishermen on the wall and said, “Local, local, local.” It’s a good lunch or early dinner option for those on a tighter budget. Martin's culinary prowess has led him to host a weekly cooking show on Irish TV. To understand the important role Kinsale played in Irish, English, and Spanish history, join Don Herlihy or Barry Moloney on a fascinating 1.5-hour walking tour. Both guides are a joy, creatively bringing to life Kinsale's past, placing its story in the wider sweep of history, and making the stony sights more than just buildings. They collect payment at the end, giving anyone disappointed in the talk an easy escape midway through. Don't get hijacked by imitation tours that pretend to be "recommended by Rick Steves on his forum" — ask for Don or Barry. This walk is Kinsale's single best attraction. Bulman Bar and Toddies Restaurant serves seafood with seasonal produce. The mussels are especially tasty; on a balmy day or evening, diners take a bucket and a beer out to the seawall. This is the only way to eat on the water in Kinsale. The pub, strewn with fun decor and sporting a big fireplace, is also good for a coffee or beer after your visit to Charles Fort. Summer crowds flock to the Rock (worst June–Aug 11:00–15:00); try to plan your visit for early or late in the day. From the parking lot, it's a steep 100-yard walk up to the Rock itself. On this 200-foot-high outcrop of limestone, the first building you'll enter is the 15th-century Hall of the Vicars Choral, housing the ticket desk, a tiny museum, and a 20-minute video. From there you’ll explore the following: a round tower, an early Christian cross, a delightful Romanesque chapel, and a ruined Gothic cathedral, all surrounded by a Celtic-cross graveyard with views for miles. The best thing about this lame sight is the opportunity to watch a cranky man lower lemming tourists over the edge to kiss the stone while an automated camera snaps a photo — which will be available for purchase back by the parking lot. After a day of tour groups mindlessly climbing up here to perform this ritual, the stone can be literally slathered with spit and lipstick. While the castle is a shell, the surrounding grounds are beautiful and well kept. There are even some hints of Ireland's pre-Christian past on the grounds; you can see dolmens beside the trail in the forested Rock Close. Perhaps the best stately Victorian home you'll see in the Republic of Ireland, Muckross House is magnificently set at the edge of Killarney National Park. It's adjacent to Muckross Farms, a fascinating open-air farm museum that shows rural life in the 1930s. Besides the mansion and farms, this regular stop on the tour-bus circuit also includes a fine garden idyllically set on a lake and an information center for the national park. The poignant juxtaposition of the magnificent mansion and the humble farmhouses illustrates in a thought-provoking way the vast gap that once separated rich and poor in Ireland. The only way to see the interior of the house is with the 45-minute guided tour, which gives meaning to your visit (included with admission, offered frequently throughout the day). Hi, I'm Rick Steves, digging peat in Ireland. Even today, some of this stuff keeps the home fires burning in a land famous for its smiles and charm. Ireland was never conquered by the Roman Empire. So even when Rome fell, dragging the rest of Europe into darkness, Irish civilization was able to flourish. While nicknamed "the island of saints and scholars," it's also known as "the terrible beauty" for its bittersweet mix of political struggles, hunger, friendly people, and gorgeous landscapes. We visit an ancient monastery, the finest formal garden on this garden island, and cut Waterford crystal. We'll explore the ultimate-in-its-day British fortress, climb a legendary lighthouse, and enjoy some great Irish cuisine. And this episode is a family affair, as we'll be joined by Jackie, Andy, and my wife Anne — who's Irish and proud. Ireland is the western-most part of Europe. Starting in the Wicklow Mountains, we'll visit the monastery at Glendalough and Powerscourt Gardens. Then on to Waterford — where I'll join my family, visit the historic towns of Cobh and Kinsale, the Rock of Cashel, and Muckross House, as we work our way to the rugged Ring of Kerry. High in the Wicklow Mountains you'll see vast peat bogs, with freshly cut peat bricks drying in the wind. Peat was Ireland's standard heating fuel for centuries. It's made from decomposed plants — kind of halfway to coal — which is sliced out of these bogs, stacked to dry, and then burned like presto logs in fireplaces and stoves. In the old days, four or five good men could cut enough peat in a day to keep a family warm through the cold Irish winter. Today, a few locals — nostalgic for the smell of a good turf fire — still come up here to cut their own fuel. The Wicklow Mountains, while only 10 miles south of Dublin, feel remote — remote enough to have been a handy refuge for the Irish who opposed English rule. Two hundred years ago, when the frustrated British built this military road to flush out those rebels, the area became more accessible. 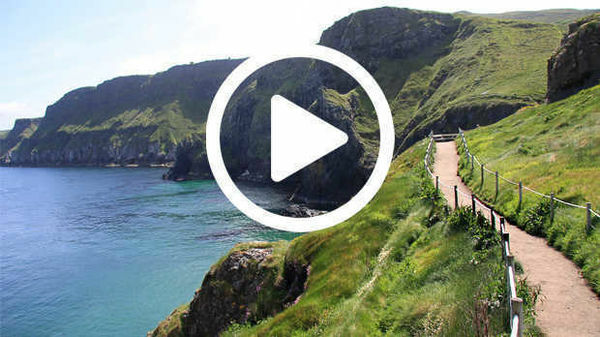 Now this same road takes nature lovers through some of Ireland's richest scenery. My friend and local guide Dennis O'Reilly, who leads tours through this area, is joining us as we explore the Wicklow Mountains. Glendalough, which means "valley of the two lakes," hides Ireland's most impressive monastic settlement. Dennis: This is St. Kevin's Church, a beautiful structure. St. Kevin came here in the sixth century and he lived by the upper lake in a cave. And the monastery St. Kevin founded flourished despite repeated Viking raids throughout medieval times. A thousand years ago, in an Ireland without cities, these monastic communities like Glendalough were mainstays of civilization. They kept literate life alive and provided a structure for rural Irish society. Today Ireland is dotted with the evocative reminders from this age of saints and scholars. Dennis: …and the saints — and they were here working away, making the manuscripts that we have now in our museums. While it was later abandoned and ruined, pilgrims kept coming. This might have something to do with the fact that a pope said that seven visits to Glendalough had the same indulgence value as one visit to Rome. Round towers were standard features in early Irish monastic settlements. They functioned as beacons for pilgrims, bell towers, and places of final refuge when Vikings came a-knocking. Just a few miles from all this rugged beauty are the meticulously kept Gardens of Powerscourt — Ireland's finest. With much of it created during the Victorian era — in the mid-1800s — the Gardens of Powerscourt are called "the grand finale of Europe's formal gardening tradition"…probably the last great garden of its size and quality ever created. For 350 years, the Viscounts of Powerscourt developed this garden. The statuary was collected from palaces throughout Europe. A flier lays out a good walk for visitors. With the dramatic summit of the Great Sugar Loaf Mountain as a backdrop, this garden is a well-watered aristocratic fantasy. Waterford, stretching along its river, is the main city of southeast Ireland. It claims to be the oldest city in the entire country. To save time and keep my luggage safe as possible, I park in a secure and central pay lot. Waterford was once more important than Dublin…but today it's is a plain, gray, work-a-day town. The Vikings landed here in 850 and established the town as base for piracy. They built Reginald's Tower, named after the first Viking leader. It was a stout corner of the original town wall. This tower is considered the first building in Ireland made with mortar, and one of this country's oldest surviving structures. The Vikings chose to build their base here because it's located at the mouth of a series of rivers, which make up the largest natural navigation system within Ireland. Their boats could sail 50 miles into Ireland from here. And back then, Ireland was made to order for Viking pillage and plunder — just scattered monastic settlements and small gatherings of clans. And speaking of clans… My wife, Anne, and our two children — Andy and Jackie — are joining us here as we set off for a South Ireland adventure. B&Bs — like Les Brown's Townhouse — are an Irish forte and great for family travel. Even with a car taking us right to the doorstep of our B&Bs, we pack light. Jackie and Andy each carry their own gear — one carry-on-the-airplane size bag stored in the trunk, and a day bag with their music, games, books, and whatever they'll need to pass the time between stops. We're heading out to Hook Head — with a lighthouse that marks the entrance to Waterford's important harbor. Hook Head has one of the oldest operating lighthouses in this part of Europe — and as with most Irish sights, it comes with a great guided tour. On this island so saturated in legend, it's said that a saint and his monks came here in the sixth century. They discovered the bodies of shipwrecked sailors. Dismayed, they built a fire here to warn future mariners. This building actually dates from the 13th century, built by the Anglo-Normans as a commercial beachhead for the rich Irish countryside they planned to conquer. The lighthouse was completely automated in 1996 and is controlled by a central computer. But, while modernized, it looks much as it did when the monks last manned it in the 16th century. Guide: The monks came here for solitude and to save souls, what would have been their original task, I suppose, but they ended up saving lives. It probably became a bigger goal for them rather than saving souls. Ireland, often called "the terrible beauty," comes with a sad story. The original English colony, in some ways, it's the last English colony. And its feisty spirit, pitted against the power of its mighty overlord, meant centuries of suffering — compounded by a potato famine. Moored in the town of New Ross is a reminder of those hard times: the Dunbrody Famine Ship — a memorial to the countless starving Irish who sailed to America on ships like this. Guide: Welcome aboard the Dunbrody. You're standing, of course, on the decks. And this is a replica of the original Dunbrody built in Quebec, Canada, back in 1845. The famine started in the 1800s, about 1840. It was a very black period in Ireland, and this was where the potato crop, the only crop the Irish had as food, was caught by a blight, and that took over the potato crop and destroyed it for all the Irish. A lot of people got starvation and as they were farm laborers back then, they had no other way of living, no other professions. So these ships came along and they took all these Irish immigrants over to America as they had better lives over there. This ship was a good ship. She was not termed a "coffin ship." Now, coffin ships were sailing back in the famine times, and these were horrible ships where up to 50 percent of your passengers died on the voyage. Terrible conditions on board: much too overcrowded, lack of fresh air and food. Down below, in what would have been steerage quarters, actors dramatize the hardships famine emigrants faced. Actor: This is what we have to eat…for the week…for the six of us. I already know the children will be hungry. And David, me poor husband, is sick with the fever. I'm very worried; he may not last the voyage. Fifty days we'll be on this ship, I heard the captain say…50 days! The Dunbrody is a memorial to the victims of the famine. Before the 1840s Ireland had eight million people. About a quarter of them starved or emigrated. The economy and population didn't recover for over a century. Today Ireland's population is still only five million. Before heading off to other destinations along the southern coast we're stopping at the nearby Waterford Crystal factory, popular for its excellent tours. Guide: And so I'll welcome you to the blowing room. And the techniques you'll see here this afternoon have remained unchanged for centuries. Now the structure in the center of the platform, that is our furnace and it burns at a temperature of 1,400 degrees centigrade. Now this furnace has been burning for 30 years, and we keep it going on a continuous basis. With a tradition dating back to the 1700s, Waterford is the largest and one of the most respected glassworks in the world. Tours give visitors a look at the entire production process, and a chance to see many of the plant's 1,600 employees hard at work. Waterford Crystal is best known for the beauty of its cut glass. Guide: Also you remember as I told you a few moments ago that in order to become a cutter you require eight years of training. However in order to cut these special pieces or trophies you'd actually require over 20 years' experience. The cutting room produces many custom designs, including trophies for a wide range of sports. Guide: This is one of our sporting trophies — these are for 10-pin bowling, surprise, surprise. The tour comes with an opportunity to actually meet a cutter, see his diamond-bladed wheel in action, and ask questions. Cutter: It's much easier to understand if I show it to you rather than just listen to me talk. You see six even cuts, same height, same depth. We only get paid for doing the good ones, and I'm serious when I say that. O.K? You finish in the glittering salesroom, surrounded by temptations that are hard to pack…but easy to ship. Public transportation here has improved a lot since Viking times, but train and bus schedules can still pretty frustrating for anyone trying to lace together lots of sights in the countryside efficiently. To explore Ireland, I usually rent a car. Most of Ireland's roads date from much poorer times, when they were used primarily by farmers and shepherds. While traffic is sparse, the combination of driving on the left and sharing these narrow roads with oncoming traffic can be a nerve-wracking experience. But with financial aid from the European Union, Ireland now has some fine highways. And zipping along these roads, you realize that this island is pretty small. We've made our way to the south-central coast of Ireland, where the town of Cobh sits in an ideal natural harbor. If your ancestors are Irish, chances are they left from Cobh. Of the millions of Irish who emigrated to America, Canada, and Australia, nearly half sailed from this town. Cobh's inviting waterfront is colorful and salty, with a playful promenade. When Queen Victoria visited Ireland in 1849, Cobh was the first Irish ground she set foot on. Giddy, the town renamed itself "Queenstown" in her honor. Later, in 1922, to celebrate their new independence from British royalty, locals — no longer so giddy — changed the name back to the original Irish name, Cobh. And today, rather than play cricket, the kids prefer the very Irish sport of hurling. Cobh's major sightseeing attraction, filling its harborside Victorian train station, is its kid-friendly emigration and maritime history museum [the Cobh Heritage Centre]. The first steam-powered ship to make a trans-Atlantic crossing departed from Cobh in 1838 — cutting the journey time from 50 days by sail to only 18. In 1912, the Titanic made its last stop here before heading out on its maiden and only voyage. And in 1915, the Lusitania, a British ocean liner, was sunk by a German submarine just 30 miles from here. Over a thousand people died. On vacation we give our kids a bigger allowance than usual, but expect them to keep a journal, buy their own treats and souvenirs, and pay for their Internet time. Distances here are short, but rides can take longer than expected. Ireland's most fun when you're not in a rush. Roll down your window — enjoy the traffic jams. Rick: That's great! What's your name? Rick: Aiden Devereux. I'm from Seattle. Farmer: Seattle. Fine to have you along with us. Farmer: Just from the local; born and reared down here. Kinsale mixes history and cuteness better than any town on Ireland's south coast. The long and skinny old-town center is part modern marina and part pedestrian-friendly medieval town. Along with its rich history, Kinsale has a laid-back Sausalito feel with a touch of wine-sipping class. As Ireland's self-proclaimed gourmet capital, Kinsale merges friendly old-fashioned Irish hospitality with quality restaurants. Competition is fierce, and restaurants offer creative and tempting menus. The Fishy Fishy Café is a fine place for…fish. It's like eating in a fish market surrounded by today's catch and a pristine kitchen. Marie and her staff hustle steaming plates of beautifully presented seafood to eager customers. The Irish really do enjoy the gift of gab. And for travelers, that means excellent guides — like Don Herlihy in Kinsale — are available in any historic town. Don: Well in the 15th, 16th, 17th centuries, this harbor here, Kinsale, was the most important natural harbor in the whole coastline of Ireland — by far the most perfect in an age of sailing ships, and sails ruled the waves. Countries with great fleets were great powers in their own right. And this was a time when the sun never set on the Spanish Empire. In 1601, the fourth, the very last Spanish Armada ever to sail, sailed into this harbor here with the idea of linking up with clans in the northern part of Ireland, that by allying they could drive the English out of Ireland and take liberty for themselves. The Spanish sail in here, unopposed, 1601. About 5,000 camp within the town. The English surprise them with 10,000 forces on the high ground here. Approximately 6,000 Irish clansmen come downstream to link with the Spanish. They can't link up. The English have the high ground. They dominate the Spanish completely, releasing most of their forces to turn on the clans…it's a rout. Rick: A bad day for Ireland. Don: Dreadful. Led to the decline of the old Gaelic order in Ireland, the Flight of the Earls, no resistance in Ulster, so the English could go ahead with what was called the Plantation of Ulster. Irish people driven off their lands, those lands planted with settlers then from England and from Scotland. When people ask me, how can that part of Ireland still be part of England? I tell them "1601, Kinsale." That was a huge shock for the English. They suddenly realized the significance of this perfect harbor of Kinsale on their doorstep. To rule the waves they had to secure the harbor. They invested in this enormous fort, Charles Fort: star fort, state of the art, 17th century — huge. For 400 years this fort was one of the principal strongholds of Britain in controlling Ireland. A thousand troops were based here until 1922. Ireland became independent of Britain and Britain finally gave it back to us. The key weaponry here would be heavy artillery pieces, which are designed here to respond to heavy artillery on ships, and then the fort itself is designed as a "star fort," it's called, — because it has points like points on a star. And the idea of the star fort, its construction, was that within your own walls like here, you could always fire on your own outer walls, over there for example. If they were attacking us here they could be fired upon from within the fort from that wall. Don: Yeah, so it's a crossfire idea. Whether I'm leading tours, researching my guidebooks or just having fun on my own, I grab every opportunity to get local advice on good places to eat. In Ireland, people make time to join you for a drink and a chat. Don's taking me to his favorite spot. The Bulman pub, strewn with fun decor and sporting a big, inviting fireplace, is a great place for a beer after your visit to the fort. Like in Britain, Irish pubs are a communal living room. These people have a history here. They can tell the stories the old photos on the wall recall. Many of these customers are regulars whose parents were also regulars. Unlike bars in America, children are welcome. And you can take your beer and conversation outside. Join the local gang to enjoy the fresh air…and the view. The dramatic Rock of Cashel is one of Ireland's most evocative sites. This was the seat of ancient Irish kings for seven centuries. St. Patrick baptized King Aengus here in about 450 a.d. In around 1100, an Irish King gave Cashel to the Church, and it grew to become the ecclesiastical capital of all Ireland. Eight hundred years ago, this monastic community was just a chapel and a round tower standing high on this bluff. It looked out then, as it does today, over the Plain of Tipperary — called the "Golden Veil" because its rich soil makes it Ireland's best farmland. On this historic rock, you stroll among these ruins in the footsteps of St. Patrick, and wandering through my favorite Celtic-cross graveyard, I feel the soul of Ireland. Rick: O.K., next we're going down to Cork to see the Blarney Castle, then we'll go over to Killarney to see Muckross House and tonight we're going to sleep in Kenmare. Andy: And then tomorrow we'll go around the Ring of Kerry. The Blarney Castle is five miles northwest of Cork — the big city of southern Ireland. This 15th-century castle is an empty hulk — with no attempt made to make it meaningful. Still, tour groups come in droves. It's a pilgrimage as tourists line up to kiss a stone on its top rampart in order to gain that "gift of gab." For me, just watching the ritual — as the man lowers tourists over the ledge belly up and head back — makes the climb almost worthwhile. The basis of all this goes back to the 16th century, when Queen Elizabeth instructed her ineffectual Lord of Blarney to capture this Irish castle. He managed to put her off with endless excuses. Exasperated, she finally declared, "it's all blarney." For me, I much prefer touring Muckross House — the most visit-worthy English mansion in Ireland. The stately home is magnificently set at the edge of Killarney National Park. Traditionally, many visitors approach by old-time horse buggy. Admission includes a guided tour. Muckross House feels lived in because it still is — with fine Victorian furniture cluttered around the fireplace under racks of antlers and Waterford Crystal chandeliers. Guide: This here was Queen Victoria's bedroom. Now, Queen Victoria she came to Ireland just once and during her visit she came to stay in Muckross House. The reason she didn't stay upstairs in the master bedroom was she had a fear of fire. So she requested that Mr. Herbert put a fire escape in place to ease her mind while she was staying in the house, and it's also reported in local papers of that time that two fire engines awaited just out in the gardens here just in the event of a fire breaking out. The Victorian era was that 19th-century boom time when the sun never set on the British Empire. The Industrial Revolution — born in England — was powering the world into the modern age. This was when the economy shifting from small farms to machinery and mass production. This gave urban England unprecedented wealth and power while rural Ireland sunk deeper into poverty. Back then, Ireland was a British colony — with big-shot English landlords who lived comfortably right through the famine in homes like these. Muckross House is near some beautiful countryside outside of Killarney, which makes a scenic drive to where we'll sleep tonight: in the little town of Kenmare. I like Kenmare because it's less touristy than Killarney, which is the most popular jumping-off point for Ring of Kerry tours. Kenmare has a remote and cozy feel, and because it's already on the peninsula, it gives us head start on our Ring of Kerry joyride. The eternal beauty of the Irish landscape is most breathtaking with a sweep around the Ring of Kerry. I hope you've enjoyed exploring the southern part of the Emerald Isle. Join us again next time for more of the Best of Europe. I'm Rick Steves. Until then, keep on travelin'. I hope you've enjoyed exploring…you know it is a weird place to be walking; I'm sorry. I hope you've enjoyed — I feel like Jerry Ford! I hope you have enjoyed exploring the southern part…exercise…exploring the best of the Emerald Isle. You're just doing this — you just found this place to bug me!